Gluconeogenesis is the process by which glucose is synthesized from noncarbohydrate precursors. The major noncarbohydrate precursors are pyruvate, lactate, glycerol , and glucogenic amono acids. Some body tisssues, such as brain, renal medulla, erythrocytes, lens and cornea of eye, exercising muscle, and testes, require a continuous supply of glucose as a metabolic fuel. Hepatic glycogen can meet these needs for only 10 – 18 hours in the absence of dietary carbohydrate. Liver glycogen stores are depleted during a prolonged fast and glucose is synthesized by the process of gluconeonenesis. Liver and kidney are the major organs where gluconeogenesis occurs. About 90% of gluconeonenesis occurs in the liver and 10% in the kidney during an overnight fasting. However, during prolonged fasting, about 40% of gluconeonenesis occurs in the kidney. All the intermeditates of glycolysis and citric acid cycle are the substrates of gluconeonenesis. The most important gluconeonenesis substrates are glycerol, lactate, and α-ketoacids derived from the deamination of glucogenic amino acids. 1) Glycerol is formed from hydrolysis of triglycerides in adipose tissue, and is transferred to the liver via blood. Glycerol is phosphorylated to glycerol phosphate by glycerol kinase enzyme. Then glycerol phosphate is oxidized to dihydroxyacetone phosphate (an intermediate of glycolysis) by glycerol phosphate dehydrogenase enzyme. 2) Lactate is derived from anaerobic glycolysis in exercising skeletal muscle and in cells that lack mitochondria, and is delivered by the blood to the liver. Lactate is reconverted to pyruvate in the liver that form glucose via gluconeogenesis. 3) Glucogenic amino acids are formed from the hydrolysis of proteins. α-ketoacids such as α-ketoglutarate and oxaloacetate are derived from metabolism of glucogenic amino acids. α-ketoglutarate formed oxaloacetate via citric acid cycle. Oxaloacetate is a direct precursor of phosphoenolpyruvate (an intermediate of glycolysis). The pathway of gluconeogenesis is the reversal of glycolysis pathway. Seven reactions of glycolysis pathway are reversible and are used in gluconeogenesis in liver and kidney. Three reactions are irreversible and must be circumvented. Reactions of gluconeogenesis occur both in mitochondria and cytoplasm of cells. Reaction 1: Pyruvate is converted to phosphoenolpyruvate by the enzyme pyruvate carboxylase. Biotin and ATP are required as cofactors in this reaction. 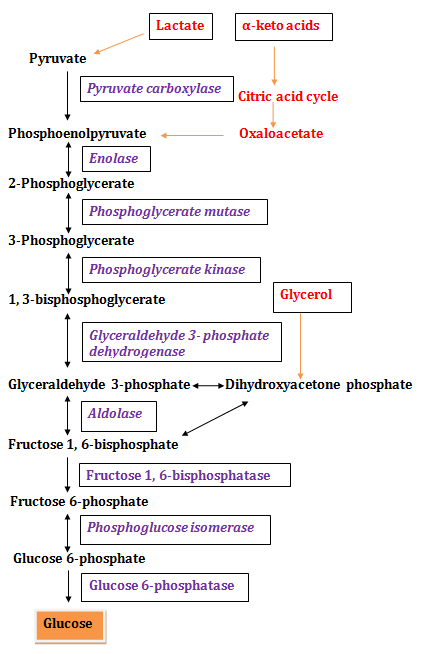 Reaction 2-7: Conversion of phosphoenolpyruvate to fructose 1, 6-bisphosphate occurs by the sequential reactions, which are simply the reverse of those that occur in glycolysis pathway and same enzyme catalyze them. Reaction 8: Fructose 1, 6-bisphosphate is converted to fructose 6-phosphate by the enzyme fructose 1, 6 bisphosphatase. Reaction 9: Fructose 6-phosphate is converted to glucose 6-phosphate by phosphoglucose isomerase. Reaction 10: Glucose 6-phosphate is converted to glucose by the enzyme glucose 6-phosphatase. 1) Glucagon – Glucagon is the principal hormone that stimulates gluconeogenesis. 2) Substrate availability – The availability of substrates for gluconeonenesis, particularly glucogenic amino acids regulates hepatic glucose synthesis. Low levels of insulin favor mobilization of glucogenic amino acids from muscle protein, which are used in gluconeogenesis. 3) Allosteric activation by acetyl CoA – During fasting, the rate of formation of acetyl CoA by excessive lipolysis in adipose tissue exceeds the capacity of liver to oxidize it to carbon dioxide and water. As a result acetyl CoA accumulates, which leads to activation of hepatic pyruvate carboxylase. 4) Allosteric inhibition by AMP – AMP inhibits fructose 1, 6-bisphosphatase.